Since our update last week regarding the introduction of photo support, we’ve introduced 9 new features (depending on what you determine a feature) plus a bunch of tweaks! We’ve begun the introduction of graphical statistics which you can access by clicking your email address in the top right hand corner. Currently the graph shows your character length over the past 30 days, helping you spot days when you’ve forgotten to write an entry or days in which you’ve had less to talk about. Let us know if there’s a set of statistics you’d like to see. We’d like to make it possible to find trends, which would allow you to formulate conclusions. What makes a great day? In terms of photo support, we’ve been playing around with it trying to get it just right. We’re not quite there yet, let us know what you think. Other than the ability to view your image when viewing your entry, there is an updated standard flick through gallery, a new thumbnail gallery and a new full screen gallery. Along with this, we’ve introduced the ability to download your original picture file. Our photo uploader has also been improved to show the progress of your upload. Essentially this allows you to link to other entries through referencing a point in the future or past. For example, if you type ‘yesterday’ in your entry, when you view the entry, the word yesterday will become a link to the day before. This would similarly work with ‘this time next week’ plus other references. One of the features we were desperate to build was advanced PDF functionality, this feature is still in progress, but it’s a vast improvement on previous functionality. You can now export entries based on an array of variables into an array of shapes and sizes. Paper sizes now include Letter, A4, A3 and A5 as well as the ability to determine orientation and margin size. A significant enhancement is the ability to include your photos in your export. Again, we’re still working on improving PDF export, so please let us know what you think. You might notice changes in date formats, settings, search and account overview. The rate of new users has exceeded all expectations and we have a feature to-do list longer than a very long flat fish. Keep your eyes peeled for updates and thank you for using 280daily. 280daily is a free service, but we do have hosting and development costs. 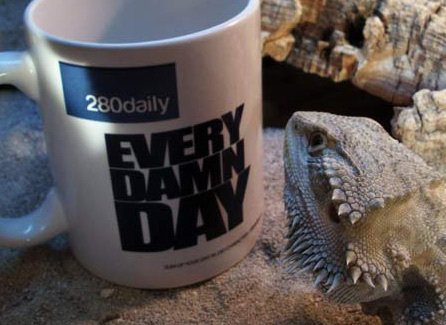 You now have the ability to purchase a 280daily mug, great if you enjoy a hot drink when writing your entries. We’ve made the process of purchasing a mug as simple as possible. Costs may be high in your continent or country due to shipping, we’re sorry about this! Modelled beautifully by our bearded dragon lizard. The mug is designed to be amusing and is in no way meant to be offensive. The slogan is a spoof of a marketing campaign by a leading sports-wear company. It’s the ideal writing companion! On entry creation, there’s a check-box below the entry. This checkbox can be used to mark the entry for any purpose you require. The default usage is to mark it as “Day of note” meaning that it’s worth remembering. This is useful when looking back at your entries (entries marked are highlighted) or searching (search by “Day of note”). Although this is the default use, you can apply your own idea of what it should be. This can be changed by visiting your settings and the “New Entry” tab, you can set it to whatever you wish. Here are 10 examples of alternative uses, but I’m sure there are plenty more. Possibly an obvious point, but if your label is, “Day of the month”, it’s up to you to make sure that you haven’t marked more than one day that month. You only get one option, so choose wisely and also remember that when you change the message, it will affect all those marked. So if you change it from, “Best day”, to, “Worst day”, all you best days will be marked as, “Worst day”, very confusing. Yesterday we rolled out photo support for 280daily. Along with your (up to) 280 character entry, you can now upload a photo. By default the picture will display under your entry when you view it. This can be changed in your settings under “Appearance”, along with the ability to completely disable photo support (you can re-enable at any time). If you have uploaded photos, you will have access to your gallery (Daily Photo). Photo support is in its infancy and we’ll be working to improve it (while keeping it simple). Along with photo support we’ve added a new account overview box, “Random Photo”, this isn’t enabled by default. When enabled, it will display a random photo that you’ve uploaded, clicking on the photo will redirect you to that particular entry. I also wanted to talk a little about the feedback we’ve received and the features we’re working on. The beauty of 280daily is in its simplicity, so there’s a delicate balance between features and simplicity, which is why it’s important that users configure 280daily exactly how they would like it. This seemed like a reasonable request, you can enable this by visiting your “Appearance” setting and locating the “Sidebar Box” header. We’ll be working on advanced exporting options for exporting to PDF and printing. Plus we’ll be introducing one of our most exciting features in the next few months, the ability to export your entries to a physical book. It’s great for us to hear your experiences! It’s also great to hear that a lot of you are using 280daily to improve how you spend your days. But I’m not dictating how you should live your life! However, if you can achieve one thing a day that you’re proud of, then what a life you must be living! This would be great, but it is of course unrealistic for most of us, which is why we have the “Day of note” feature! Finally, some of our non-english members are requesting translated versions of 280daily. This is something we’d like to do when 280daily has planted itself firmly. While we’re currently introducing features and growing, it’s difficult to maintain translations. Thanks again for all your feedback, we will get around to responding to every feedback request individually, but it might be a while before you hear from us. 280daily launched officially a little earlier today. We’re already starting to gain some traction due to an excellent post on TheNextWeb by Brad. As well as providing a great overview of 280daily, Brad also made a feature suggestion, so we’ll be working on introducing the option of uploading an image with your entry. We’ll let you know once we’ve implemented the ability to upload a photo with your post. To those of you already signed up… thanks! Hate to sound like a broken record, but we really appreciate your feedback! So if you have any feelings/ideas/problems please share by clicking the hovering feedback link on the left hand side of the page. You’ve heard correctly, 280daily is mobile friendly. We do however not yet have any native apps for any of the mobile operating systems. For now, the best way to use 280daily on your iPhone is to add it to your home screen. Android is our favourite mobile OS, but we probably won’t start work on it until after the iPhone App has been released. If you have any mobile related issues, please submit feedback. If 280daily isn’t automatically recognising your mobile as a mobile device, then simply direct your browser to 280daily.com/m. 280daily is pretty much ready and we’re quite pleased with ourselves. Now we’re entering into a stage of testing where we’ll be looking into every nook and cranny for problems we can fix. Official launch is 15th January. We’ve been working tirelessly (working until stupid o’clock) for over a month, building a powerful tool that essentially archives your life. 280daily was created completely from scratch, a bold move? We wanted to know that the web app would be secure and super quick and if you want a job done properly, do it yourself. Quick isn’t it?! Please feel free to signup now, but if you find a problem, bug, flaw or anything that seems strange or not user friendly… please let us know!